The first US incinerator was built in 1885 on Governors Island in New York, NY. By the mid-20th Century hundreds of incinerators were in operation in the United States but until the 1960s little was known about the environmental impacts of the water discharges and air emissions from these incinerators. When the Clean Air Act (CAA) was enacted in 1970, existing incineration facilities became subject to new standards that banned the uncontrolled burning of municipal solid waste (MSW) and placed restrictions on particulate emissions. The facilities that did not install the technology needed to meet the CAA requirements were closed. Combustion of MSW grew in the 1980s, with more than 15 percent of all U.S. MSW being combusted by the early 1990s. The majority of the non-hazardous waste incinerators were recovering energy by this time and had installed pollution control equipment. With the newly recognized threats posed by mercury and dioxin emissions, the EPA enacted the Maximum Achievable Control Technology (MACT) regulations in the 1990s. As a result, most existing facilities had to be retrofitted with air pollution control systems or be shut down. There. Now you know everything there is to know about the history of burning waste for the provision of energy. I’ve always been intrigued by the notion of WTE. Not that I’m fascinated with trash and fire, but you have to admit it’s a neat concept that kills several birds with one stone. Back in August during my daily travels around the web, I came across some particularly interesting charts regarding CO2 emissions and costs by energy source. Observe the following pair of charts courtesy of ZeroHedge via Goldman via the EIA (a division of the DOE). Solid waste? I thought for a second that it couldn’t be right, but the reason that waste is considered such a “clean” source of energy is because solid waste does not include all types of trash. Obviously tires and plastics or any other sorts of waste generated from petroleum are not included in that category as they are not renewable. 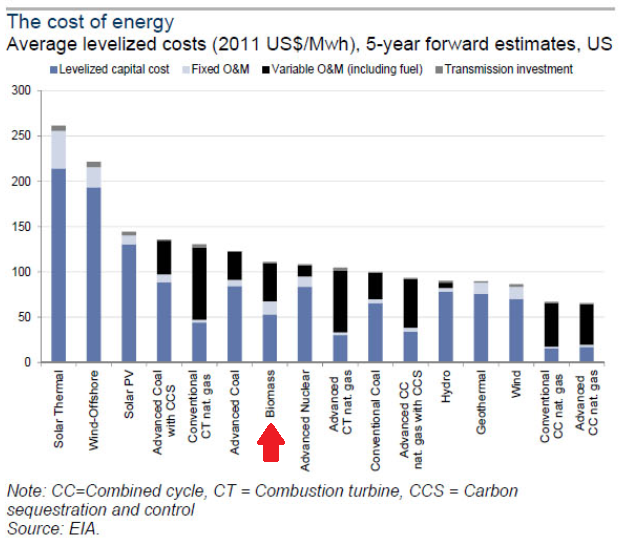 Then there’s the cost in USD per megawatt hour in the chart below. You can see that biomass incineration is not all that more expensive than some of the recognized cheaper options that we are all familiar with, such as conventional coal, some forms of natural gas, or nuclear. Hell, it’s never going to be cheaper than wind or hydro but it’s not terribly more expensive either, considering the additional benefits garnered. Hydro or wind don’t help to decrease landfill space utilization or provide recyclable ferrous and non-ferrous metals. The ash leftover from the process takes up approximately 10% of the space in the landfill that the un-incinerated waste would have utilized. Now I know that you may be thinking that isn’t biomass wood pellets or other organic forms of energy sources, such as waste from the wood mills or agricultural residues. Sure, but the biomass class of energy also includes the biogenic waste that gets tossed out with all the rest of the trash on a daily basis i.e. recyclable paper products, food waste (which us Americanos are notorious for), yard clippings, etc. There seem to be more pro’s compared to cons for an increased employ of WTE technology in the US. 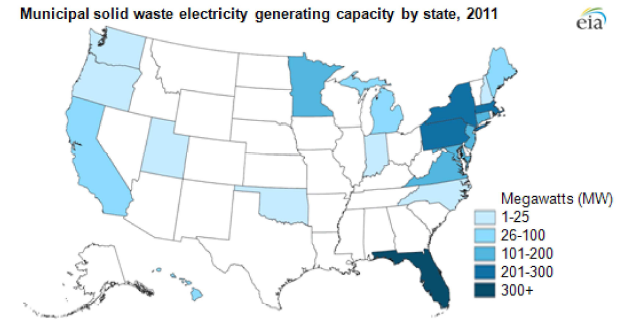 Why is it that there is only about 90 WTE plants in the US, with the vast majority concentrated on the east coast? We have about 90 of these facilities for approximately 300M people but the European Union countries have about 400 WTE facilities for their approximate 500M people. It just seems to me like there’s an opportunity there for cities, counties, or states to take advantage of the multiple benefits of utilizing WTE facilities within their jurisdictions. The following chart, from the EIA, depicts America’s total disregard for the WTE option (there’s a lot of white): The Clean Air Act amendment back in 1990 essentially forced the hand of the WTE industry to shape up the emission standards which is how the energy is now considered renewable. It’s not just about CO2. The dioxins and furans, which are so toxic, and yet were so prevalent previously are virtually a thing of the past with current emission technology. Compliance with federal regulations for emission standards set the stage for WTE facilities, which now employ multiple levels of filtration during the process and through the flue stack to generate a “clean” emission. 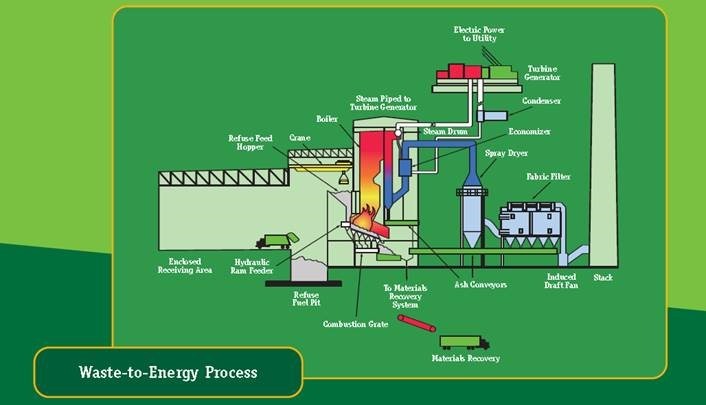 Here’s a picture of the process, courtesy of Waste Management: The technology advancements in the final stages of the process are truly remarkable. And I absolutely refuse to believe the lack of facilities is about the economics of constructing a plant that renders the WTE option unfeasible for so many cities and counties. I recognize that every municipality has their own financial situation to deal with but what about all the damn sports stadiums built at a cost of a billion or more over the last 20 years. The taxpayers generally fund a considerable portion of those stadiums. Those stadiums do bring jobs, tax revenues, and often tourism to the community but they provide virtually no benefit in the form of carbon footprint reduction, power generation, or metals recovery. For the most part, it would seem as if the major culprit behind the lack of WTE utilization in the US is politics. It’s a general statement but I’ll provide you with a perfect recent example. The city of Cleveland, as of the summer of 2013, shot down a plan to commission a WTE facility. The facility would have cost $180M, which breaks down to approximately $782 per ton of waste annually. That’s actually on the lower end of the cost scale when compared to international WTE facility cost analyses. Now when you factor in 30 year contracts for trash haul and power generation combined with a captive audience for your customer base along with materials recovery, you’re telling me the economics can’t work? Can Cleveland do any worse in the management of their municipal waste at this point? Anybody can go on the city site and take a quick look at the 2011 books (the last available) and see that the city’s Division of Waste Collection and Disposal had revenues of $14M against expenditures of $24M. Now I ain’t exactly tip-top on my governmental fund accounting, but the last I checked that was called a deficit of $10M. Money couldn’t be any cheaper right now so it can’t be the cost of capital for a city the size of Cleveland and a potential bond issuance, with A1, A2, and A3 ratings by Moody’s for a series of bonds. What about equity partnership? Certainly Waste Management, Covanta, or Veolia would be a viable partner with plenty of access to capital and resources to facilitate funding. How about private equity? The revenues would be very small to the comparative asset base for players such as Brookfield Asset Management or Blackstone, but access to guaranteed income streams that could perform in the face of potential inflation are pretty attractive investment options these days for plenty of players. Ultimately, it comes downs to politics. A certain group of constituents, armed with all the wrong information but definitely all the right votes, voiced their opinions loud enough to get the project essentially declared dead. No doubt after the city had wasted hundreds of thousands of dollars or potentially millions on those “oh-so-important” consultants exploring WTE project options to cover the rear ends of anybody involved…gutless councilmen, city planners, and the like. 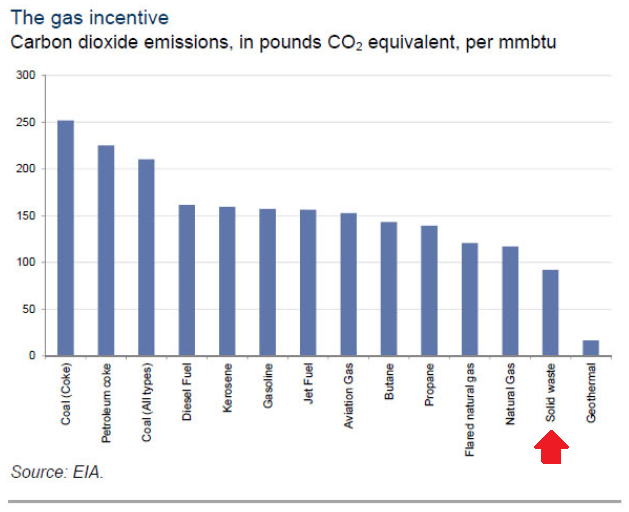 I find it hard to believe that the biggest cities in Denmark, Germany, France and the other Euro area players have such different information about emission dangers and are so much less informed than Cleveland and her constituents. While we’re on bad politics and just to beat a dead horse even deader, what about all those lame-brained schemes by Obama’s boys at the DOE to fund all those ingenious solar power and electric car operations? Let’s just do a quick run-down and see how the costs of those mistakes compare to Cleveland’s potential WTE facility. Apparently, it never occurred to the current administration to seek out high potential WTE opportunities across the US that I’m positive could have benefitted from some of that money that was essentially flushed down the toilet a few years back. It’s amazing how a rant can sort of take on a life of its own in one’s brain. Anyways, from an investment standpoint there isn’t a whole lot of compelling options. Covanta is by the far the number one WTE player in the US with approximately 50% market share. A distant second, you have Waste Management but they are more focused on the gas produced from their landfills, for which they definitely have the dominant position. WTE plants aren’t really WM’s thing. Veolia has an incredibly large international presence but they are highly focused on water and municipal transportation management in the US as opposed to WTE. The political aspect leaves the players in the game of WTE almost too much at the mercy of others. However, from a pure investment standpoint Waste Management presents a long-term compelling opportunity because of its overall market share in the trash space and consistent cash generation. Even if we’re only talking about WTE then Covanta does have its merits. Sam Zell is the Chairman and largest shareholder. Marty Whitman, of the Third Avenue fame, has a huge chunk. They have a little under $400M in NOL’s to utilize and they consistently generate over $200M in free cash flows, which is enough to service that fairly large debt level compared to their current cash level. The dividend yield is around 3%. Aside from those merits though, is the fact that the short percentage of the float is over 10%. Plus, a lot of the normal valuation standards show that it’s a little bit rich at these prices and ROE suggests potentially poor allocation of capital by management. The point I was trying to make was not to expound on the investment merits of the WTE space. Instead, I simply wanted to share my curiosity as to why WTE’s American presence is so weak. Why is this not a higher growth industry? There are only a handful of points presented here behind my marked bias, so if you’re interested in obtaining a bit more depth in the WTE industry or the companies therein then get out there and do some research.